A class apart experience is Pa Pa Ya. 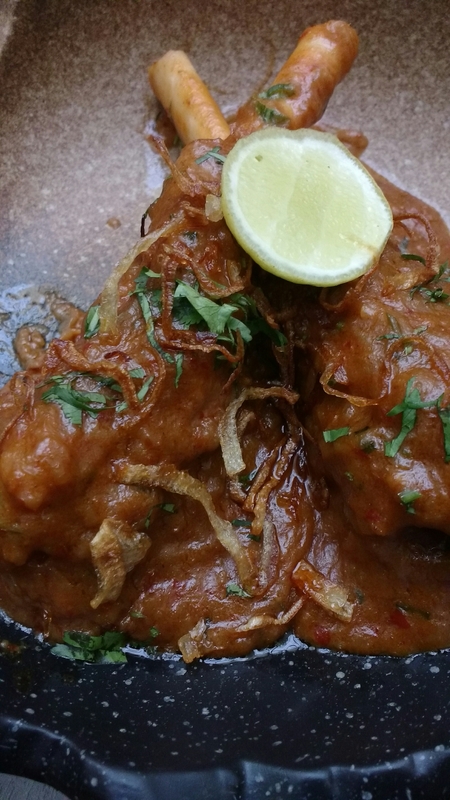 From the makers of landmark culinary destination like Masala Library, Farzi Cafe and Made in Punjab introduces yet another revolutionary culinary concept as Pa Pa Ya to the diners in Delhi. After a huge success in Mumbai and creating a buzz in Asian hawkers Pa Pa Ya is now open for public to enjoy the finest Asian in Delhi. Combining grandeur, elegance and Asian elements with a union of Japanese architecture and Indian design makes dining at Pa Pa Ya a dynamic experience. As you enter the place the first thing you notice is the huge space it has to offer, also the ceiling which is quite high and looks like a dome when seen from sitting just underneath it. A fully equipped bar which is at the centre of the restaurant is a special attraction. As I have read many reviews and got some hints for the recommendations we straight away started ordering the food. 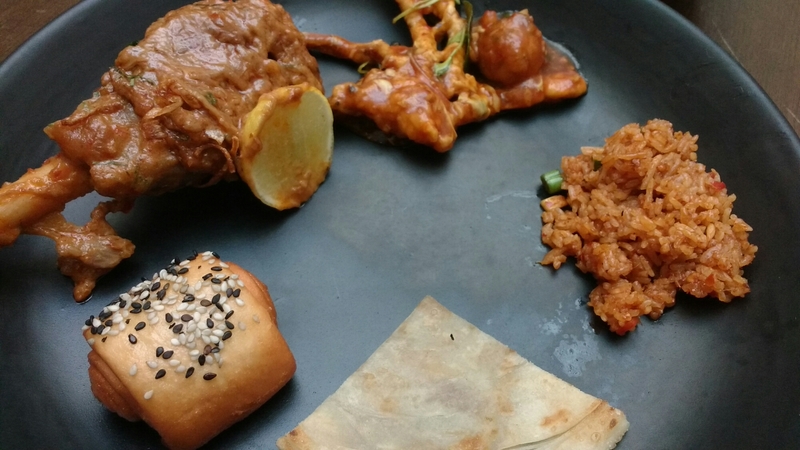 The expansive menu represents influence from Thailand, Japan, Korea, Malaysia, China, Singapore etc with their own special touch of innovation and contemporary cooking techniques. So without wasting any time we started ordering. The most fascinating thing on my list was Sushi Matrix, 19 variations of Sushi is a music to my ears. When it arrived it was truly inviting and beautifully presented. 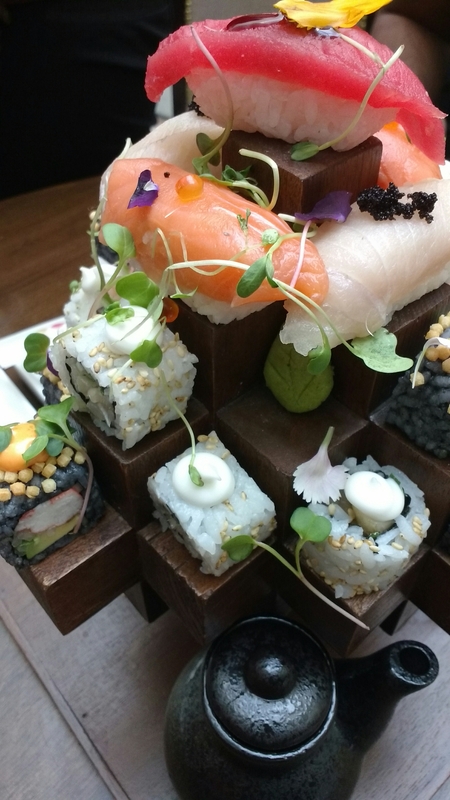 From Nigiri, Sashimi, Maki and Uramaki all with different flavours and combination. I live Sushi and this was a treat for me. 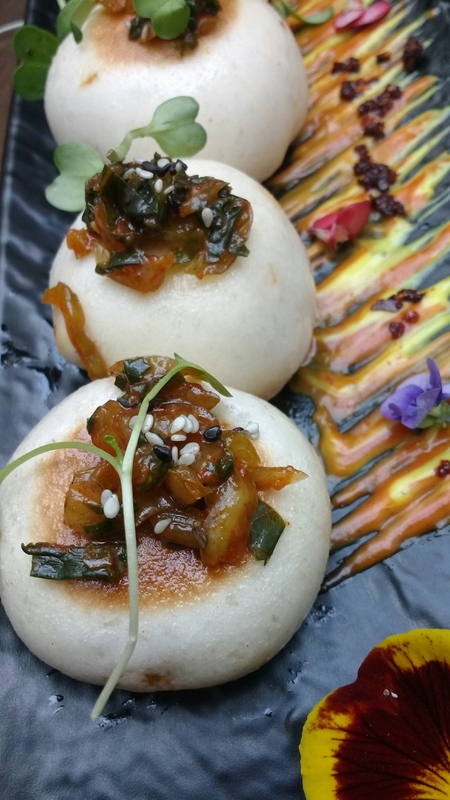 Soft shells Crab Buns is one delicacy to order here. 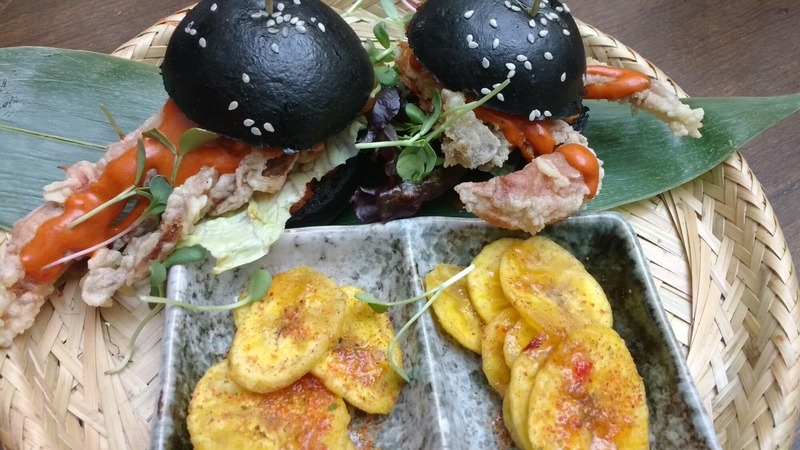 The small buns that can’t hold these fantastic flavourful crabs, hassle free crab indulgence. Prawn Hargao needs no introduction they serve the best in town. 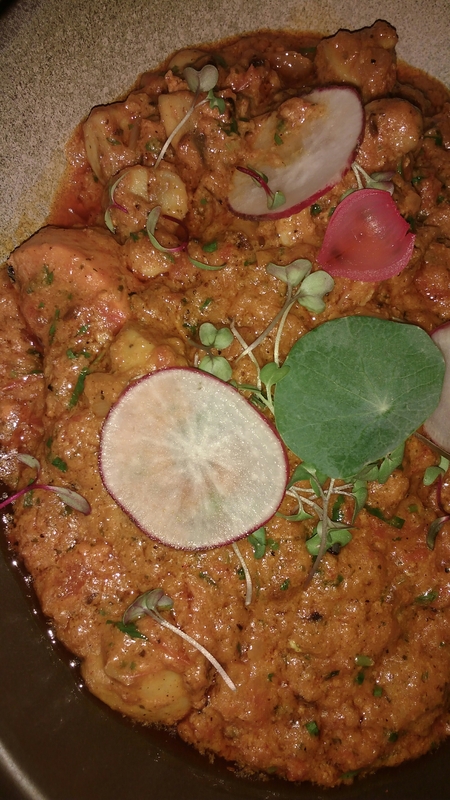 Lamb Rendang Curry is one dish I would recommend not to share, Mutton cooked for more than 12 hrs in aromatic spices. The meat was melting soft yet had retain its body. Finally ended with some dramatic desserts. 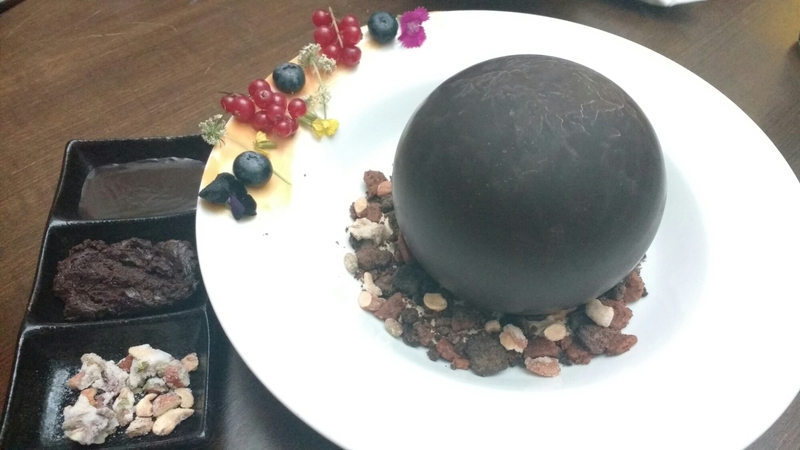 Chocolate Ball on fire Is a chocolate lovers delight. Brownie, ice cream, chocolate sauce, Nutts all inside a chocolate dome. Best way to have this is mix them well and enjoy slowly. One more dessert that we ordered was Vanila Pannacotta which was served with Lemon flavoured Sponge this was good for me. 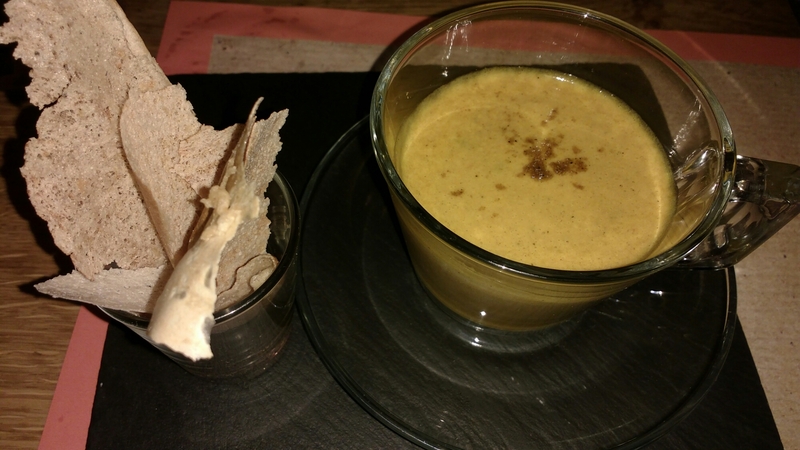 The Pannacotta goes well with Lemon Sponge, one with strong flavour and other with mild flavour complement each other. 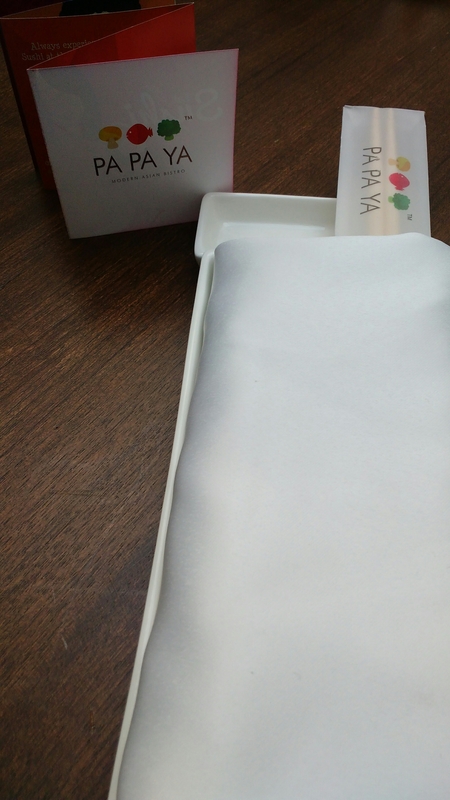 Loved their innovation with desserts. So the feast comes to an end. Dining at Pa Pa Ya was an excellent experience. Looking forward to vist again and try some more of their specialities. Zodiac made our Lohri very special…. 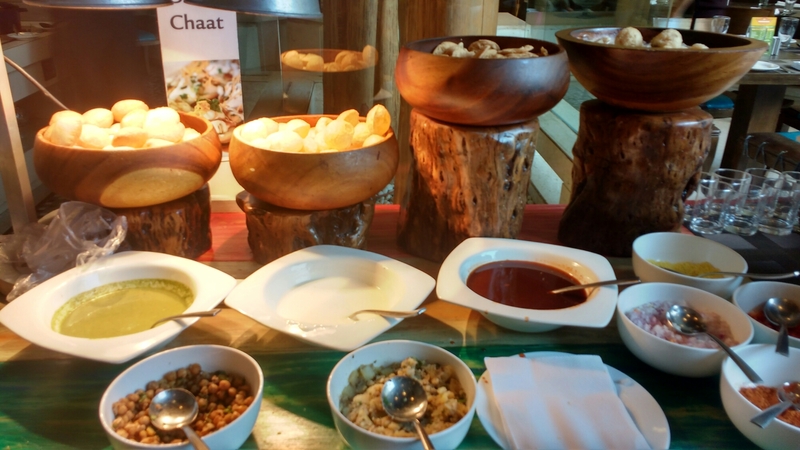 ​A buffet always attracts Indian Foodies and when a lunch spread so vast and diverse it surely is a treat. Zodiac being a part of Fortune Select Excalibur excellence in all aspects is guaranteed. 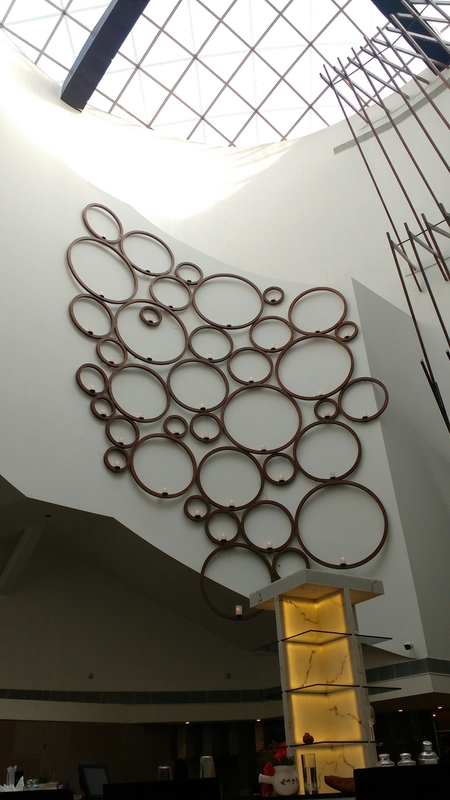 As you enter Zodiac a calm and sophisticated ambiance greets you. 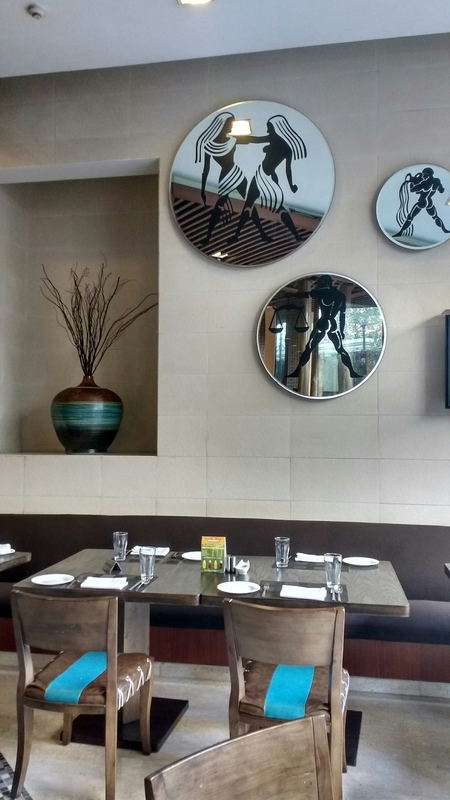 Ample amount of natural light and a pleasant view will redefine your dining experience. 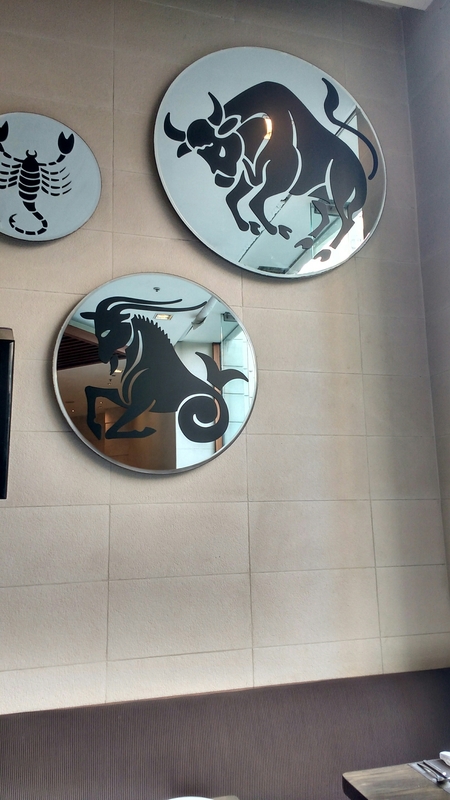 Interior are completely justifying the name “Zodiac” as all 12 signs are beautifully displayed on the wall. So we were a group of 10 people who went on Lohri for lunch buffet. From Indian to Chinese and Italian all was in their lunch buffet. We started with had Golgappas, Tikki and Beer Batter Fish Fry. 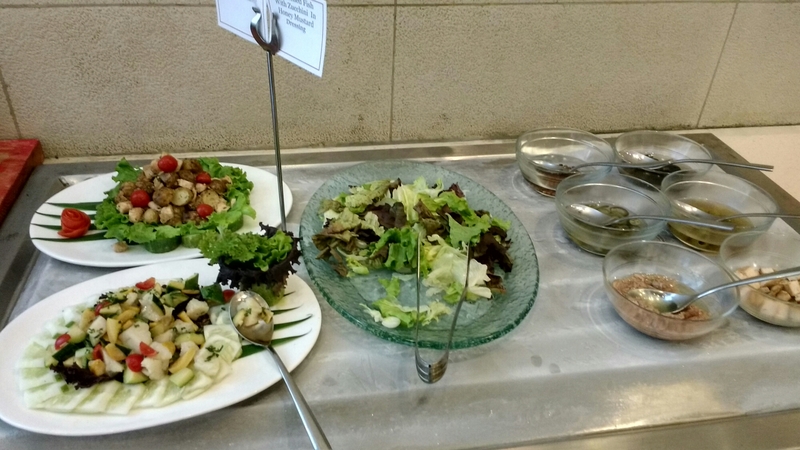 Quinoa salad and Broccoli with Lettuce salad were also there. 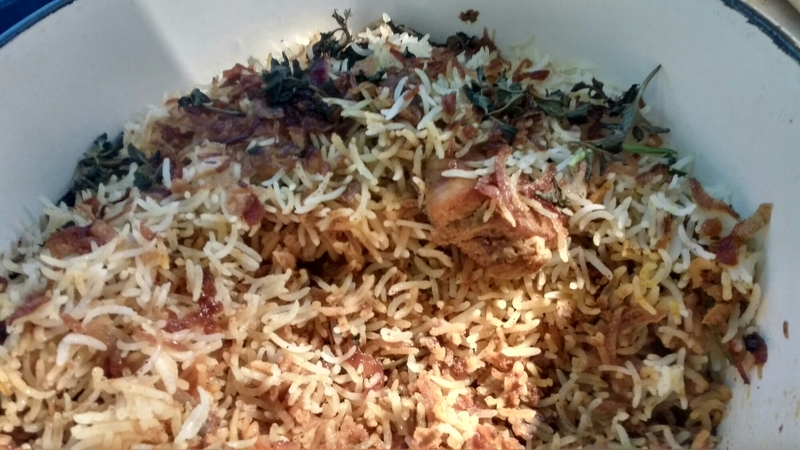 In mains Hyderabadi Gosht Biriyani was the show stopper, delectable flavours and very tender meat in it. I. Vegetarian Paneer Lababdar was the best. 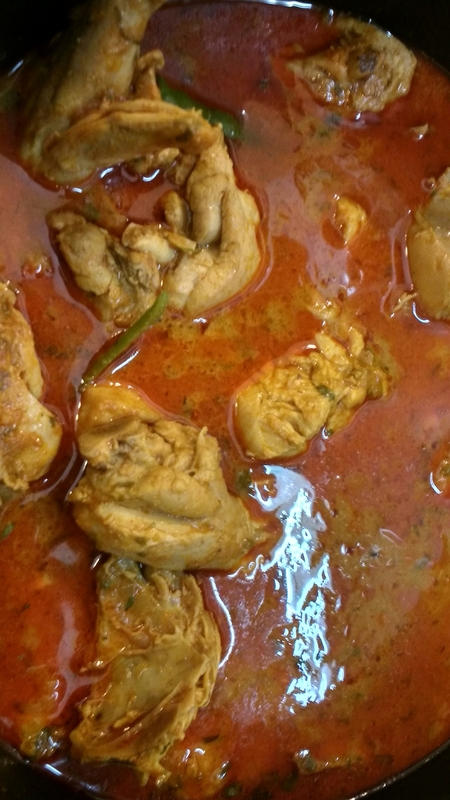 Dal Makhni, Chilli Chicken and Fish in oyster sauce was also there. Chilli Garlic Noodles, Veg Fried Rice and Assorted Breads was also served to go with gravy dishes. Live pizza station was also a part of their buffet, so a slice of fresh made Margarita Pizza was also devoured by us. Finally all ends well if it ends with something sweet. 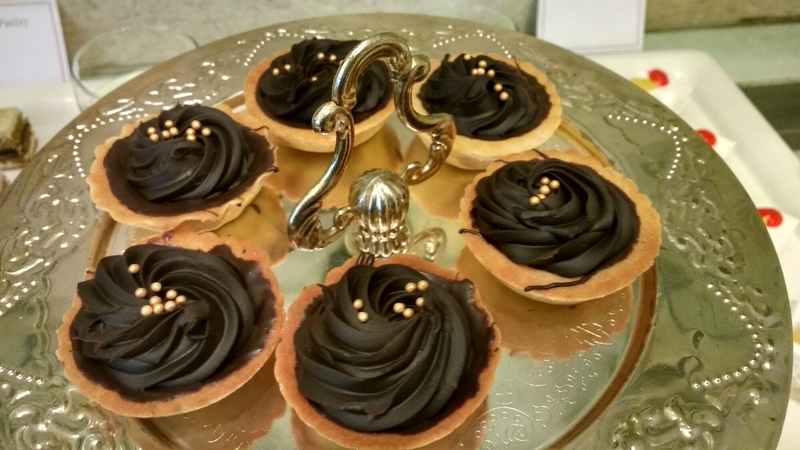 It was like a sweet paradise Rasmalai, Anar Kali, Mud Cake, Tiramisu, Chocolate Tart and many more. Had an amazing lunch at Zodiac. Must say a fine place on Sohna Road. 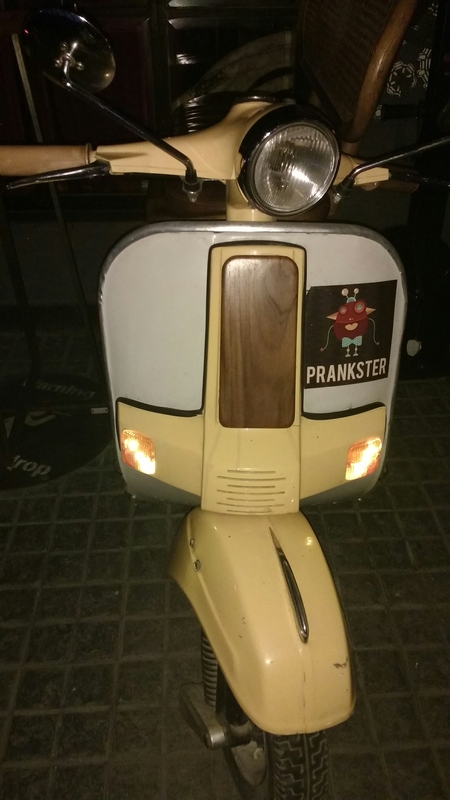 ​Prankster is one place I wanted to visit from a very long time. After reading the reviews about the ambiance and the theme the curious Foodie in me just wanted to visit Prankster. Visited there on a weekday evening and was totally bowled over by the ambiance. The place has created a college like ambiance where the entire restaurant is divided into 7 sections. The Classroom where a huge screen is the blackboard and the sitting arrangements is done to give a classroom feel. The Chemistry Lab has ditto chemistry lab feel where you are free to do any experiment with your drinks. The library and the canteen are also there. The Parking and the Hostel are the best place. In the Parking Scooters and a Jeep are there to sit and as its outside you can enjoy the view. 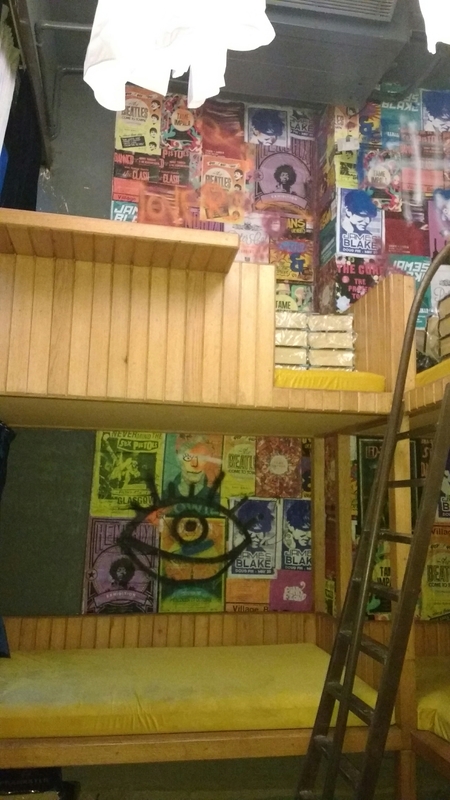 The hostel has bunk beds where a sitting for two can be done or can be a private party area. 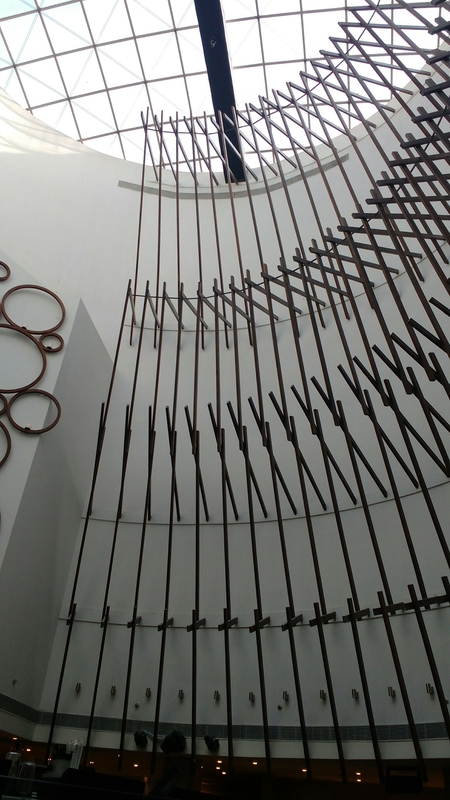 As I said the ambiance is mesmerising and with different themes given to different sections makes it more interesting. 🎖Sambhar Cappuccino with Dosai Crisps: Very unique soup it is, warm and thick Sambhar with lots of froth on it. Topped with some gun powder and Crispy dosa to go with it. 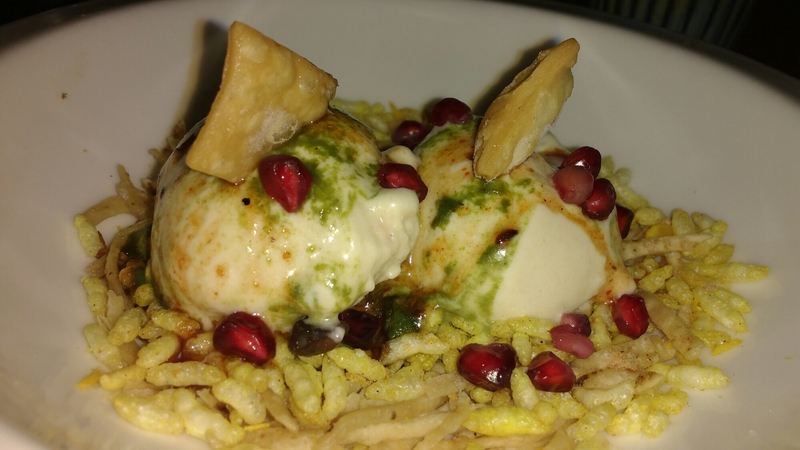 🎖Nitrogen Cooked Dahi Bhalla: If you are a Chaat fan you will love this. It’s actually a Dahi Bhalla Ice Cream served with Roomali Roti turned into sew and Paapdi. 🎖Pao Bhaji Zinker: Our entire life we had Pao with a Bhaji mash but the chef here is serving it as a Vada Pao. 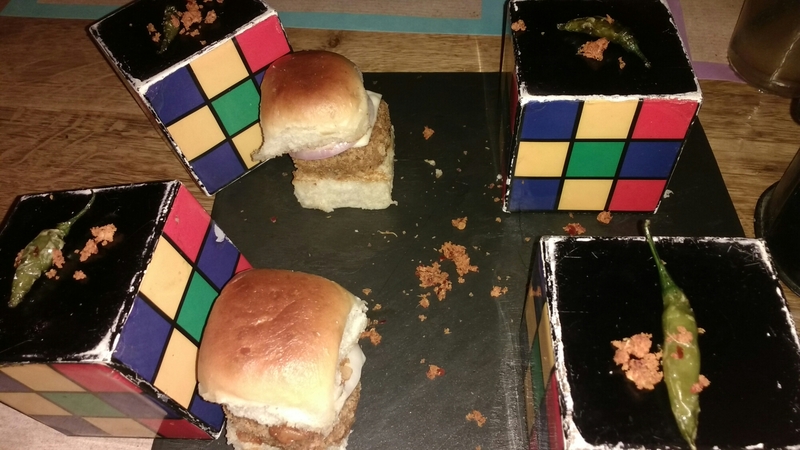 The bhaji mix is modified into a Crispy Patty and placed inside a Pao with Cheese on top. Served with Marathi Garlic Crumb and fried Chilli. 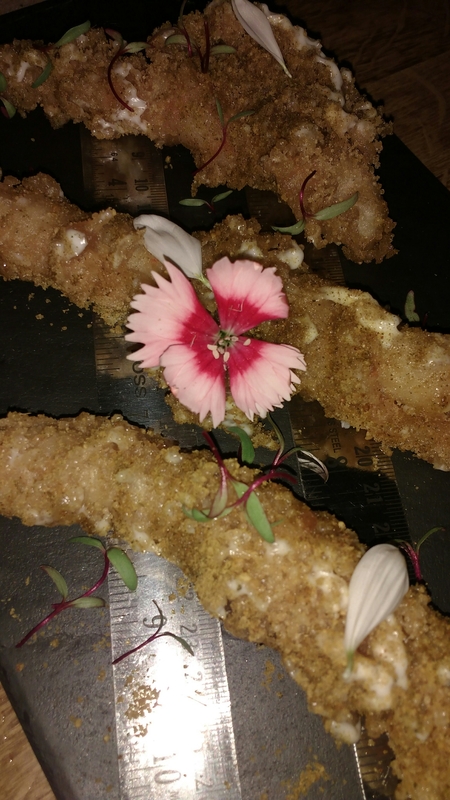 🎖Tempura Tiger Prawns: I love Prawns and here they make it the WOW! way. Very Crispy Tempura Prawns with a sprinkle of Milagaipodi ( it’s like gunpowder) Masala. 🎖Fattirs: It looks like a Pizza but tastes different. It’s actually Egyptian Pizza, do not expect it to be a thin crust Pizza. It has a Crispy Filo pastry base with Cheese and toppings of your choice. 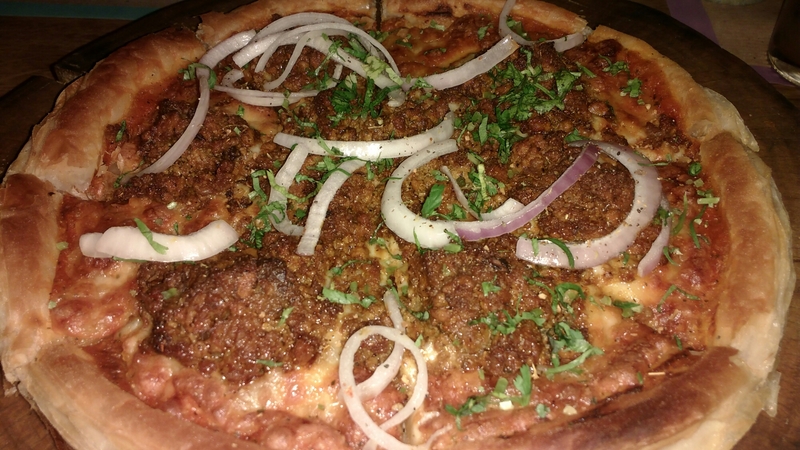 It’s not Overloaded with Cheese as expected in a normal pizza but it tastes heavenly and is not heavy. 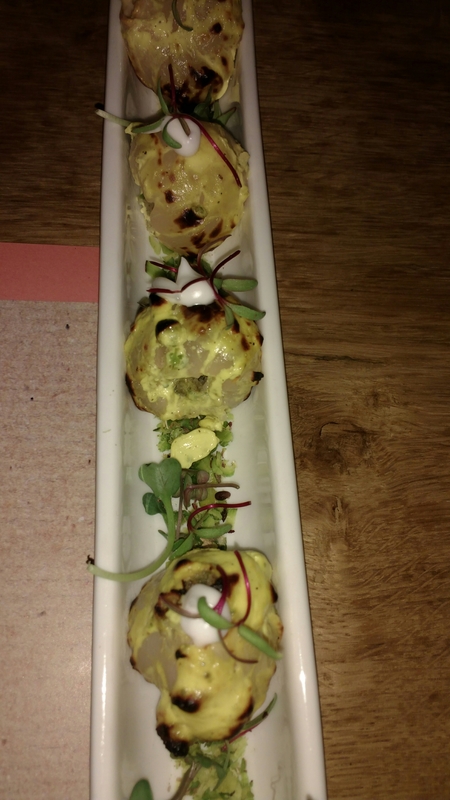 🎖Lichi Tikka: A unique dish is this tikka. 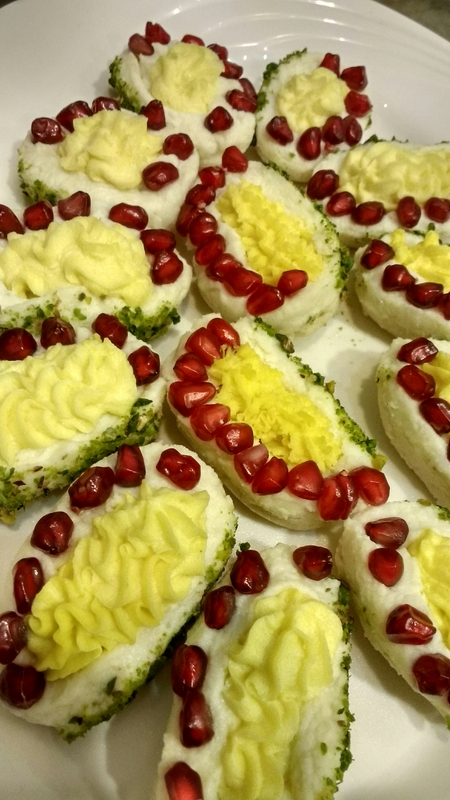 Sweet Lichi is stuffed with Mawa and nuts then roasted to give a Smokey flavour. Now I loved this tikka very much, sweetness of lichi and rich Mawa together an amazing delicacy. 🎖Rampuri Ghosht: An absolutely delightful dish to have with any bread. The tender meat with a fine Spiced gravy was Heavenly. I personally do not like gravy dishes but this particular gravy left plate licking. After a round if some unique and some amazing food we were craving for something sweet. So we ordered the simplest thing on the menu Pineapple Pastry and Rose kheer. From a kitchen where innovation and inspiration is the key mantra I wasn’t expecting something simple and ordinary. 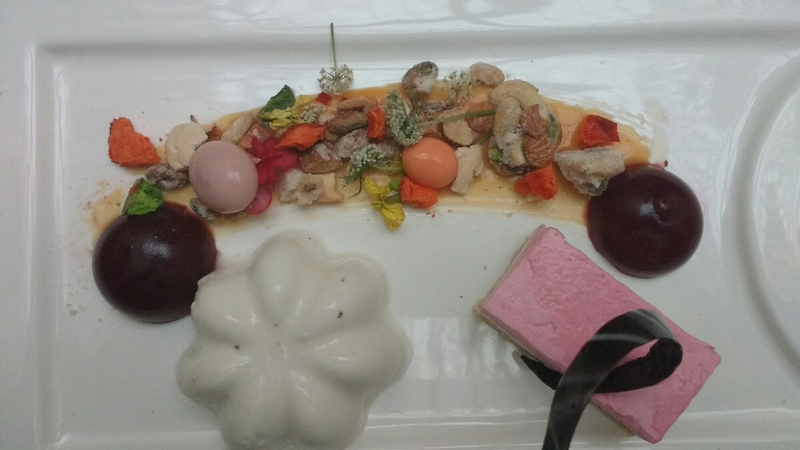 🎖 And arrives the kheer, with a molecular show. 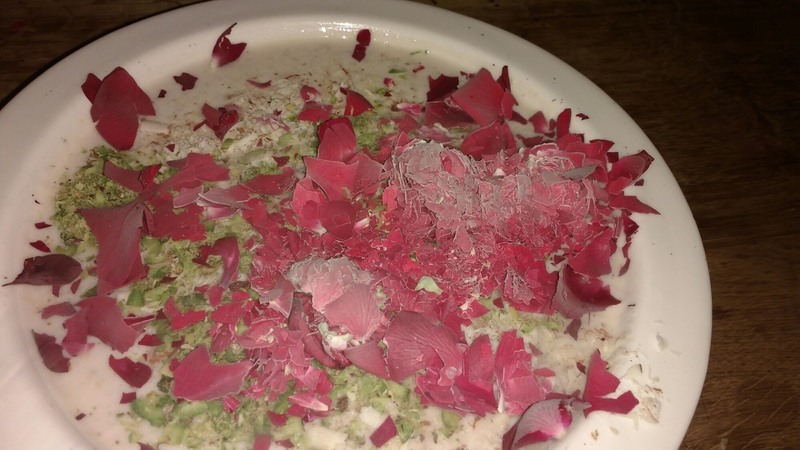 Original rose were frozen in nitrogen and crushed on the kheer. Here the rose kheer is not flavoured with Rose Water, but Gulkand is used in it and the crushed rose gave it a distinct flavour. 🎖Pineapple Pastries: Yes it was simple yet the finest Pineapple Pastry. 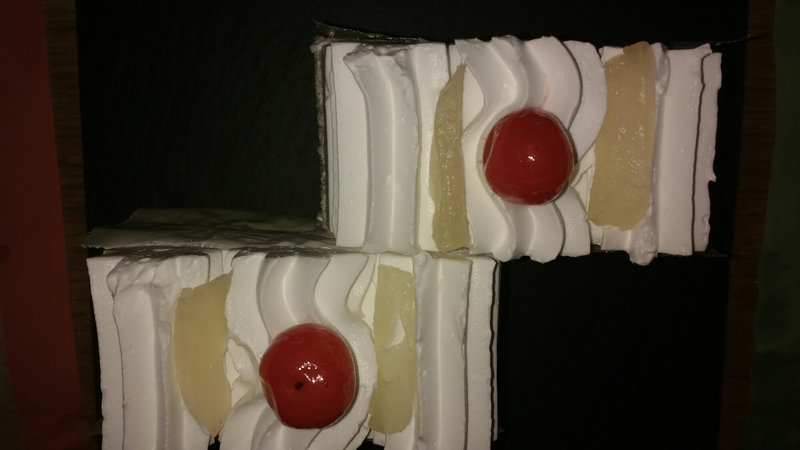 With Pineapple chunks in every layer the pastries tasted heavenly. Must say one of the best Pineapple Pastry. So we ended our dinner with a big smile on our face. 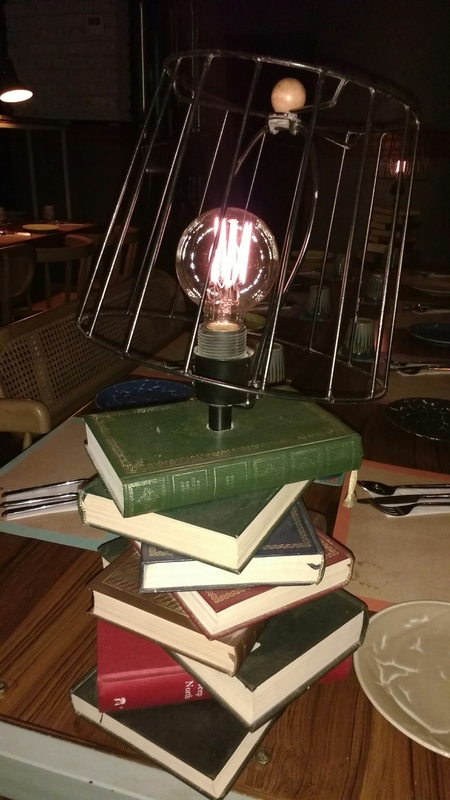 Impressed by the ambiance, the food and Chef’s innovation I feel it’s the best place in sec 29 Gurgaon.